New York City Mayor Michael Bloomberg says that lawmakers who are “going with the NRA” are “going against the lives of our children.” “And we have an obligation to tell each other and to try to convince people that if they’re going with the NRA they’re going against the lives of our children and of you and me,” Bloomberg said during a press conference last week to announce a city-wide recycling program. Bloomberg was asked about whether his group Mayors Against Illegal Guns will target Arkansas Sen. Mark Pryor, a Democrat, who opposed gun control legislation in the Senate. “What I have said is that we are going to support those people who want to stop the killing of 12,000 of our citizens every year or the 19,000 that commit suicide with handguns every year,” Bloomberg said. “And I think you and I both have an obligation to do that. “And the ways you do that is to make sure that the elected officials understand that you’re gonna vote for somebody else,” he said. 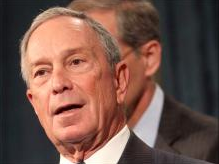 Mayors Against Illegal Guns, of which Bloomberg is a co-chair, has vowed to target members of Congress who would not support stricter gun control in the wake of the school shooting at Sandy Hook Elementary School. “And we’re going to do everything we can to make sure that somebody else gets elected who wants to see that we stop this carnage,” Bloomberg said. According to the National Journal, the group is “seriously considering” a vast television, radio and direct-mail campaign against Pryor, who opposed universal background checks for firearms, including those online and at gun shows. In most of those cases, the trigger was never pulled. Simply brandishing a firearm STOPPED the attacker. In the 20th Century, 170 million people were annihilated by their own governments AFTER being disarmed. History proves Gun Control has never been about guns… It’s about CONTROL. No…. Mr. Bloomberg…. GUNS save the lives of defenseless children. The NRA is right and lawmakers who stand with the NRA are standing by 90 million gun owners with over 300 million guns who killed no one last year. The only people who stand by YOU Mr. Bloomberg, are the criminals, thugs, and marxists who want law abiding Americans disarmed. An armed America is a Free America. Most true Americans with the passion of our Founders would rather DIE free than LIVE a slave. Handing over our guns is not an option. To read more by Jan Morgan, visit janmorganmedia.com.